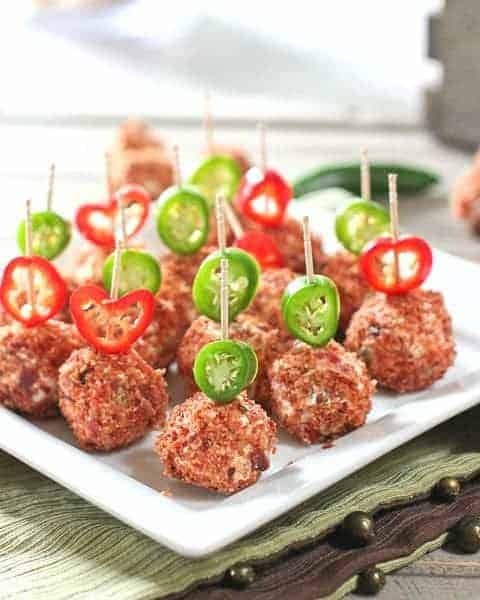 Jalapeno Popper Cheese Ball Bites! 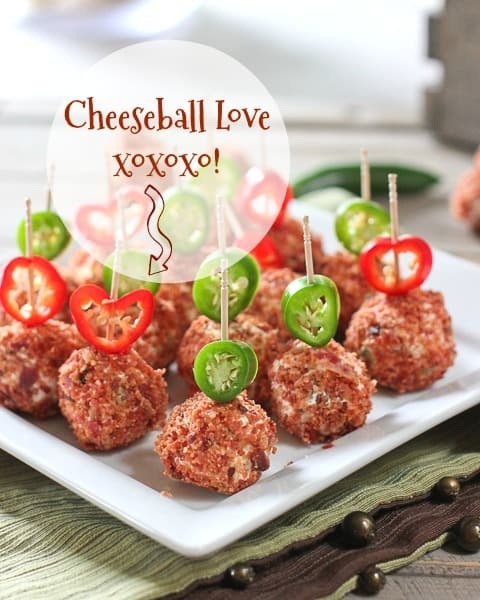 – These fancy looking mini cheese ball bites are a breeze to make! 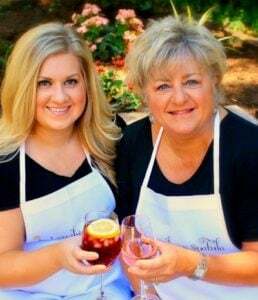 Using simple ingredients that create a big flavor appetizer! Your own personal cheese ball! No more double dipping worries…no more broken crackers as you try to dip them into that hard cheese ball. Your worries are over! 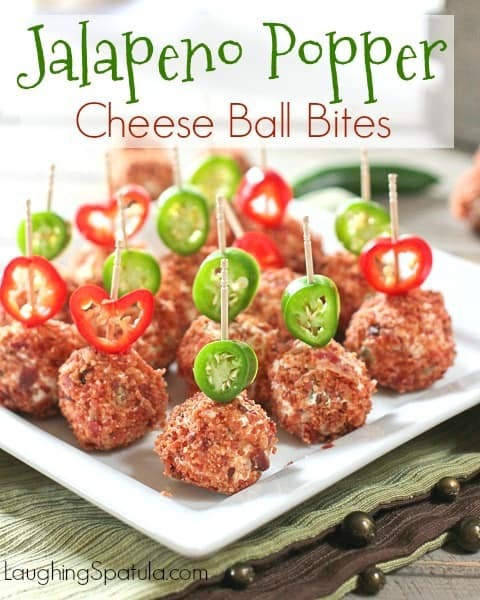 I give you Jalapeño Popper Cheese Ball Bites! These beauties come together in a flash. You know how I hate long drawn out recipes. You don’t even have to turn the oven on to whip up a batch of these. All your gonna get is sticky fingers! I used pre-cooked bacon…gasp, I know ! Not sure I’d want it next to my fluffy eggs, but they sure work good for this recipe. I crisped them up in the microwave and gave them a quick chop in my blender. I mean a real fast pulse…easy to pulverize it to bacon dust if your not careful. I used jalapeños that I seeded and removed the veins from. You probably know thats where all the heat lives. After that stuff is out, all you get is a nice slow burn. We are not fans of super spicy stuff around here, but if you are…leave the heat in! Buy a couple extra peppers for garnish. I bought a red one too, because I thought it was pretty. I was so happy it made a heart for me…such a nice little pepper. One batch makes about 30 bite size balls of about 2 teaspoons each. I used the Kitchen Aid with the paddle to mix it all up, because I figure if I’m going to dirty a bowl, it might as well do the mixing for me. You can go in manually if you like. This recipe works with regular or light (neufchatel cheese) cream cheese. I have made it both ways and can not tell a difference. The first time I made them I rolled them in toasted panko and added the bacon to the cream cheese mixture. (see below photo). I liked that too, but thought the bacon was a bit more tastier on the outside than the inside. (my peppers were really showing love that day!). Use regular or light cream cheese. Either works great. Give your hands a quick shot of non stick spray before beginning to roll the bites. Seed and devein your peppers to reduce the heat if desired. Buy extra peppers for garnish. If using a food processor or blender to make bacon crumbs, careful not to over do. 2 or 3 pulses should do it. Nobody likes bacon dust. 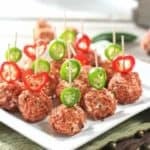 Another great no cook appetizer for you. Greek Layered Dip! Layers of store bought hummus, quick tzatziki sauce, feta and olives. Serve with pita chips! Easy to make and fun to eat! Your own personal cheese ball...yay! If using precooked bacon. Crisp up in microwave for 1 minute and cool. Using a blender or food processor, pulse bacon 2 or 3 times to chop. 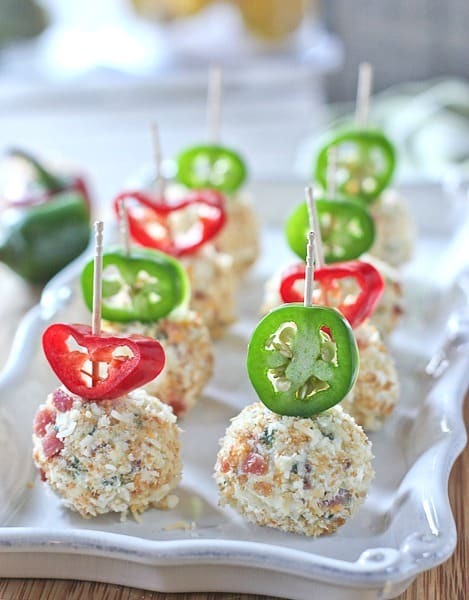 In large mixing bowl, combine cream cheese, minced peppers, cheddar cheese, green onion, salt and pepper. Mix well. TIP: Give your hands a little touch of non stick cooking spray before starting to roll balls. 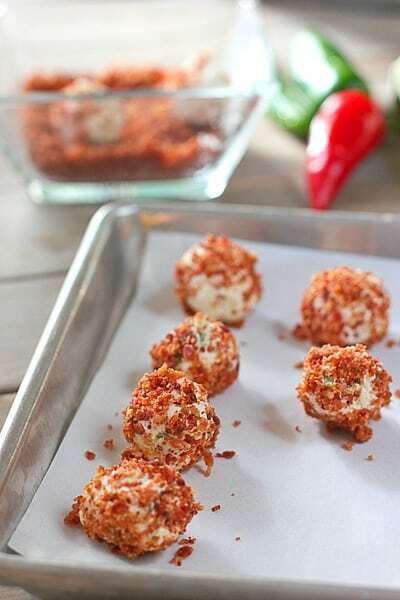 Using a heaping teaspoon of cream cheese mixture, roll into bite size balls and then into bacon crumbs. Top with sliced jalapeños on toothpicks. Will keep in refrigerator for up to 5 days. Well these are going to be my date on New Year’s Eve! Yummy! Pinned.